Time gets away from me so fast, especially now I’ve started back at work. I can’t believe my last post was in January and it’s now May – Mother’s Day (NZ/AUS) to be exact. It’s not that she can’t get around yet – she can. 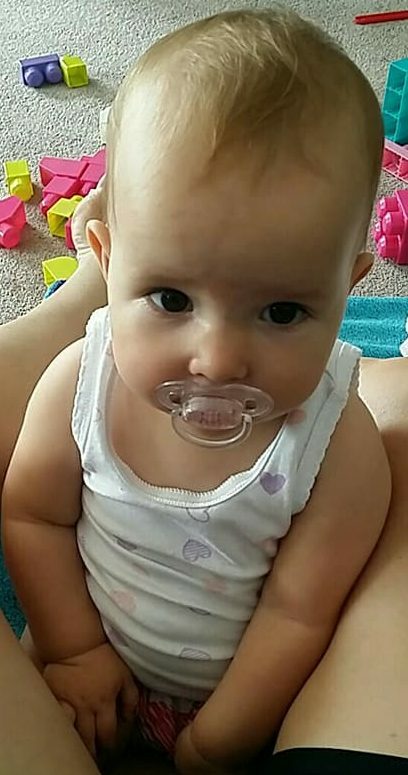 It’s a series of rolls; push up to sitting; take stock of direction; readjust position then forward onto hands and knees before flopping on her belly and rolling onwards again. The problem is she backs herself into a corner and can’t get herself out so I thought I’d give her some motivation to try forward motion. She wasn’t buying it. She sat and flapped her arms and gabbled at me, clearly indicating that I should be ashamed of myself for my feeble attempt at blackmail and just give her the damn icing. In the end we compromised. She got up on all fours and stretched her head forward turtle-style. I complied to her request and stretched my finger out to meet her little mouth to give her a lick. She started crawling the week before I went back to work and now she’s pulling herself up and shuffling along if she’s got a handhold. This cheeky little monkey is 10 months old today. That means she’s been ‘outside’ longer than she was ‘inside’ and the freedom is starting to show. No longer does she sit quietly and play with her toys on the lounge room floor. Instead she has become a forward crawl-shuffling, sideways-rolling demolition derby keen on doing harm to herself and everything within reach of her cute little mitts. All with this look on her face. How can you resist that? It’s T minus 8 sleeps to Daycare so after a visit to the centre on Friday, I’ve realised Little Miss is going to need more rough-around clothes or else I’ll be washing every damn night. As a result, we spent yesterday morning trawling the Op Shops for shorts and tshirts (Aunty Kimmy would be proud!) 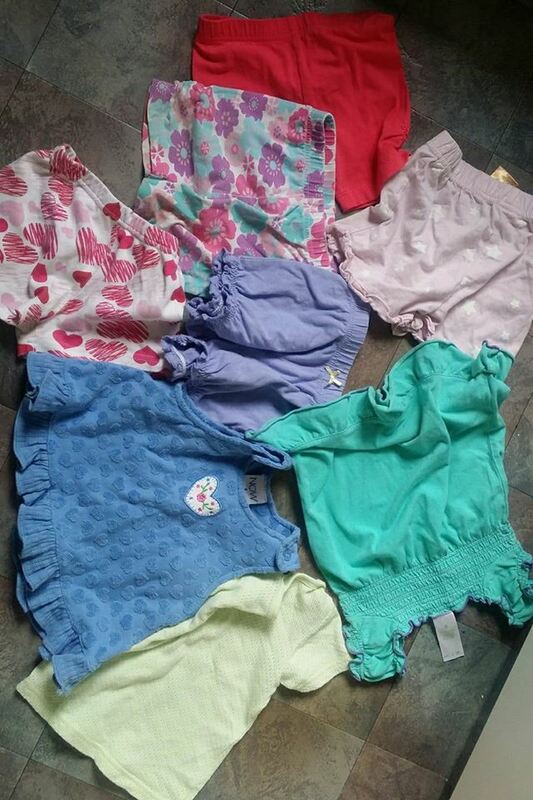 and for the bargain basement price of 50c – $1 each, scored a good stash of clothes for her. I used to do this when we lived in Western Australia and had 3 kiddies with no respect for clothing to dress. Twice a year we’d head from Carnarvon down to Geraldton for the weekend and gorge ourselves on junk food whilst getting supplies for the next 6 months, including clothes for growing kids. There’s something so satisfying about getting a bargain. The cheapest I could buy shorts and tshirts for her brand new would be around $5 from Kmart (gotta love Kmart!). But the best thing is I don’t worry about her wrecking them. She can dig in the sandpit and rub various foods into them and I won’t care. After weeks of very warm (for NZ) weather, we’ve woken to 13 degrees this morning and checking the weather report, it seems we’re back to 14 – 22 degrees for the foreseeable future. Perhaps we didn’t need so many shorts and short sleeve shirts after all. Or maybe I need to do some more Op Shopping! LOVE OP SHOPPING FOR BABY CLOTHES! It is now my new hobby. Now that I’m back knee-deep in babyland (where nobody sleeps and food is for smushing), I’m rediscovering old storybook favourites as well as happening upon some new ones. Little Miss received some great additions to her personal library at Christmas, including Hairy Maclary, Australian Animals and The Wonky Donkey. If you’re not familiar with that last one, it actually comes with a CD of the song but in this day and age, who needs that when you have YouTube? She was particularly miserable last night (bloody teeth) so I thought I’d cheer her up with The Wonky Donkey (plus the music might help drown out her grumbling). The plan worked like a charm … then the next video came up on autoplay and I thought “Why not?”. I absolutely love children’s stories but I especially have a soft spot for those that are a little bit irreverent and have a good injection of humour. And so I present to you my new favourite – The Duck Song. I still get the giggles with this song. A friend at work recently asked me what music she should play to cheer me up – I showed her this. It’s now our go-to. Today was supposed to be my first day back in the office but one power-spew later and I’m still here checking in via email and Skype while the tiny tyrant calls the shots. I’d built myself up to be ready to let her go today. I was super-prepped and everything. When she upchucked, I had a brief flash of frustration … but then she cried and what can you do? You call in sick and recalibrate for a day at home with a potential next star of The Exorcist Reloaded. Mind you, she seems fine now. When my now-grown kids were school-age, I used to call this phenomenon The 9am Miracle. They were officially dying … until just after 9am and then suddenly they felt much much better. But you can’t pack them off to school, can you? We survived our first week back at work/at daycare in true form – by the skin of our teeth. 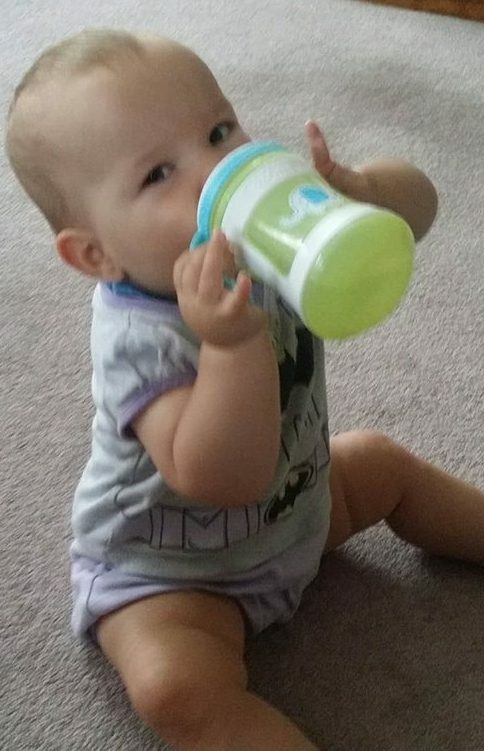 Little Miss was off to a shaky start with a tummy bug that had her home with either mummy or daddy for two days (completely fine after one spew but you know, 48 hr daycare rule and all that) but then she hit the ground running. No tears at drop-off … from her, anyway … and her teachers said she just slotted right in as if she’d always been there. That, more than anything else, made it so much easier for me to not only go back to work but actually enjoy it as well. It’s hard to put into words why going back to work makes me feel good. Money is naturally a biggie. It’s been a tight 11 months but we’ve managed to make it through and still have a bit of fun. It is a welcome relief though, to know that we can start building up a safety net again. I really don’t like skating so close to the edge. The workplace is another big tick. I love this company and all it stands for. The people are a wonderful bunch with awesome attitudes and smarts to boot. The work I’m involved with really interests me and I feel I can make a valuable contribution to the areas I’m now focused on (although I do miss handling the ins and outs of domains). Being home with a young child definitely has its rewards but there’s also an awful lot of repetition. It’s also hard to give them the socialization skills they’ll need to get along with other kids when it’s pretty much a certainty that they’re going to grow up as an only child. Sure, she has 3 adult siblings but she won’t be learning about pecking orders and sharing (the easy OR hard way) from them. 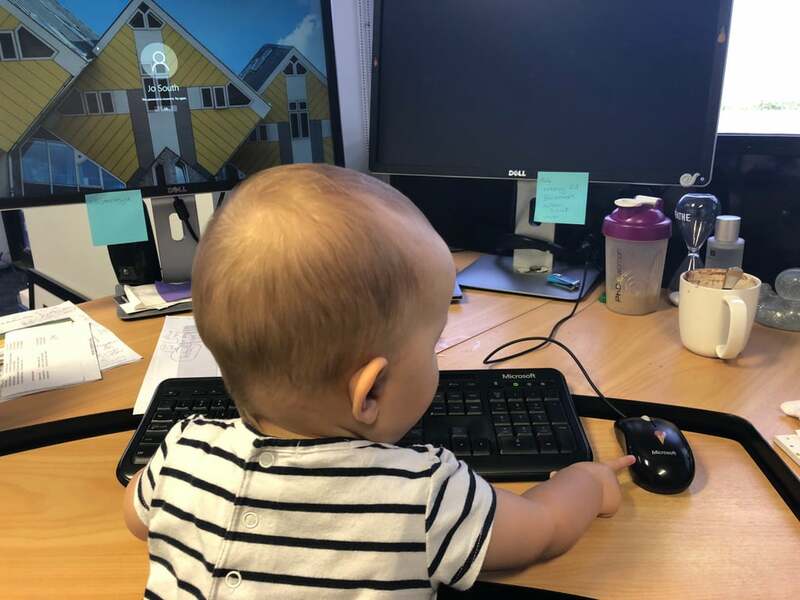 This is my first go at being a working mum with a baby and I have to say it’s a little easier than I thought it would be. But then I think the chilled out, laid-back attitude Little Miss has always possessed has made it so … and for that, I am grateful. Three months in and still loving it – even more so now we’ve got ourselves into a routine. When we got home from work/daycare yesterday I put the washing on, fed the grumbler fruit, yogurt and a baby banana biscotti (fanceee), prepped dinner, took the garbage out, hung the washing out, served dinner then finally sat down to eat. Meanwhile she’d taken a two-hour nap on Dad, so was cheerfully rejecting anything we put forward as a dining suggestion. It was then I noted she had a slightly different air about her. Tougher. More determined. Definitely more vocal. And I realised … I missed her. She’s spending all day with other people and when I finally do get her back, there’s still stuff to be done that takes me away from her. A wave of sadness washed over me and I cried, right there at the dinner table. Adjusting to a new chapter in your life is always tough. I believe in the 6 WEEK RULE – tough anything out for 6 weeks and you’ll find it starts to get easier … and if it doesn’t, then for god’s sake make a change. Life’s too short to be miserable. Fortunately, it has gotten better and the whole working/daycare thing has become part of our daily life – despite some curve balls, as the next compilation covering March and April will reveal.